The project is realized with the financial assistance of "Culture" National Fund. The city of Malko Tarnovo is situated in the heart of Strandzha Mountain, which was called by the Thracians Salmydessos, meaning "the country of the mountain top and the sea water". Today the city is an administrative center of a municipality. Its territory includes multiple dolmens, rock-cut monuments, settlements and mound necropolis. The unique nature, the preserved century-old forests, the clean waters and rare animals and birds are part of the ecological reservation "Strandzha". The region of Malko Tarnovo is inhabited from the beginning of the pre-historic era. During the Thracian antiquity the name of the settlement was probably Tzoides (Tzueidon). It was preserved during the Roman era, when all of Strandzha experienced an economic and cultural rise. The region is one of the main ore and metallurgical centers in Thrace. Over 51 copper and iron mines, used as late as the Roman era, have been researched. 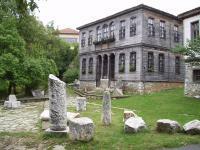 The most famous monument of the ancient Thracian culture in the region is the sanctuary in the Mishkova niva territory. The sanctuary Mishkova niva is part of a big complex located around 3 – 3.5 km southwest from Malko Tarnovo, on the left shore of the Deli river, in immediate proximity to the state border of the Republic of Turkey. The complex consists of a fortress on the mountain top called Golyamo Gradishte (Big Ruins), mines at the foot of the mountain, a mound necropolis, a fortified suburban villa from the Roman era, as well as the so-called Golyma Mogila (Big Mound). The complex is known from the beginning of the 20th century and was initially reported as an Apollo sanctuary due to the inscriptions brought from the site to the city. Golyamo Gradishte is the highest mountain top in Bulgarian Strandzha – 710 meters above sea level. Its name comes from the fortress on the top, which served as a shelter, observatory and protection of the region until and after the Roman era. It was, however, broken into by treasure-hunters during the last quarter of the 20th c. The wall of the fortress is built from crudity stones of different sizes, very solidly, without any soldering. The thickness of the wall is between 1.20 and 1.30 m. One can occasionally observe parts of bricks and metallurgical slag. The space surrounded by the fortress' wall has a diameter of around 100 m. One can discover faint remains of chambers inside. Around 30 m. southwest from the highest point of the top, there are rocky incisions preserved in the living rock. The traces from rocky incisions on the top are in the form of pits. They suggest that during a very early period – probably the 2nd – beginning of 1st mil. BC – there was an operating rock sanctuary. It probably began functioning as a fortress in later areas. Survived for millennia, the site has never been archaeologically researched. The mound necropolis in the Mishkova niva territory is crowned with the so-called Golyama Mogila, which was partially researched in the period 1981-1983. On its south side there is a monumental construction with an outer diameter of 25 m. erected. The outer circle is erected from 3 rows of white marble blocks from white local marble, which has both an outer and an inner face. The blocks which form the last, third, row of the surround have precise, rainbow-like engraved upper surface. The height of this surround is 1.80 m. On the south side of the circle is the entrance to the vault tomb, which consists of a covered dromos (corridor) and a circular chamber, the upper side of which used to end with a vault. The entrance was crowned with a fronton decorated with a shield and with two open palms. The construction consists of well-carved marble blocks joined with cramps. The floor of the dromos and of the chamber is covered with stone flooring. Near the west side of the dromos a rectangular chamber has been discovered. It is built from broken granite stones – a technique different from the one used for the tomb. From the inner side the walls are mortared. The purpose of the rectangular chamber has not been clarified. The observations of the side wall of the dromos show that two blocks were there. They used to probably be taken out in order to facilitate the entrance into the chamber, and then they used to be put back in again. 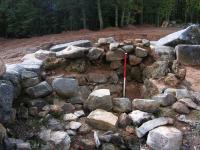 It seems that they were from an olden building, built from the same material as the inner circle – broken stones. This inner circle surrounds big granite slabs – remains of a much destructed dolmen – and it closes in the northeast outer corner of the dromos of a later-built circular construction. A platform of marble blocks with big marble troughs was discovered in front of the well-preserved entrance of the outer marble circle. Only a couple of meters west from there, there is a small stone heap where, according to the oral information, one could notice a water-main leading to Golyamo Gradishte. One could observe the ancient road leading to the sanctuary down the horizontal line of the slope south and southeast from the platform. Very few archaeological materials from the 2nd-3rd c. are discovered in the city of Malko Tarnovo. According to the local citizens, many objects preserved in the city's museum originate from this complicated site. These objects include marble altars of Apollo Aularios with inscriptions, an inscription with dedication to Heracles, and consecrated tablets with images of the Thracian horseman. One of the inscriptions shows that the sanctuary is connected with the mine-metallurgical center and with the fortified Roman suburban villa (mansion). This conclusion is drawn from the text – a dedication from the supervisor of the iron mines. The cult appurtenance in Mishkova niva is a millennium-old topos of faith, which evolves from a megalithic monument (dolmen) with enclosure to a sacred space (temenos). This transformation probably occurred at the beginning of the intensive exploitation of the mines. Until that day the dolmen was seemingly used as a place to honor a mythical forefather in the surrounding necropolis. This is suggested by the rectangular chamber adhered to the Western side of the dromos. During a later age the remains of the dolmen – transformed into a place for glorifying the divinized forefathers-heroes (heroon) and its enclosure – were inscribed in a sacred enclosed space (temenos) where god Apollo was honored. Most probably the territory between the remains of the dolmen with its enclosure and its marble circle, as well as with the earthen mound over it, was a sacred lot where the gifts and inscriptions were placed. The rectangular chamber likely served for the treasures of the hero-ancestor to be put into. During the time when the region lived through an economical bloom a magnificent vault marble construction was added to the entrance of the temenos. It could be a real tomb of a local aristocrat, or a new heroon. It is not clear when the entrance was decorated with the pediment – before or after the building of the vault construction. A prohibition was probably issued at this moment to forbid the entrance in the space between the two stone enclosures. The gifts began to be left in the newly built chambers, and in the old, rectangular one. This proves the ideological and religious connection between the two constructions. This type of sacred places – of real or mythical forefathers honored as heroes – are excellently known in the whole Southeast Europe, but the one in the Mishkova niva territory is the largest, and the most well-preserved one. These places were organized around old burial appurtenance and a necropolis formed around them. Usually these heroes-forefathers were honored together with, or in the sacred territory of a sanctuary of a god. The life of the cult complex could be estimated between the 2nd mil BC until the period of the late Antiquity (4-6 c.) Among all of its reorganizations – architectural and functional – the complex remains an evidence of the Thracian orphic faith in the immortality of the energy, as well as one of the most popular monuments of the ancient spirituality in Southeast Europe. 1. Ayanov, G. [p?] 1938. Strandzha. Ethnographical and historical research. (in Bulgarian) Sofia. 3. Velkov, Iv. 1960 Our ancient cities. (in Bulgarian). Sofia. 7. Delev, P. 1985. Two tholos tombs at Malko Tarnovo. – Thracia Pontica 2. 9. Mihailov, G. 1964 è 1997. Inscriptiones Graecae in Bulgaria repertae. Serdicae. III. 2, 1859-1869; V. 5654-5659. 12. Slavova, M. 2002. Mystery Clubs in Bulgarian Lands in Antiquity. – Opuscula Atheniensia 27: 137-149. 13. Strandzha – antiquity and contemporary times. 1990. International association "Ancient Balkan land". Sofia. (in Bulgarian).